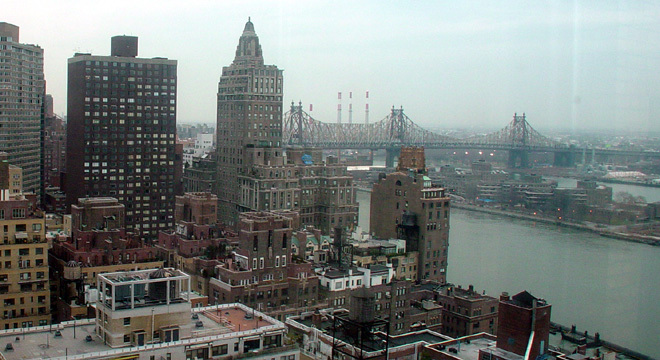 Arguably the city's, if not the world's, finest apartment building, River House is the epitome of "swell" living. Erected in 1931 when its area still teemed with tenements, it was mocked in the famous and popular 1936 movie, "Dead End" that was Lillian Hellman's adaptation of Sidney Kingsley's play. The play and movie, which starred Humphrey Bogart, focus on the not always communal coexistence of the rich in their spectacular tower of luxury and the poor swimming in the adjacent river off the dead end street. 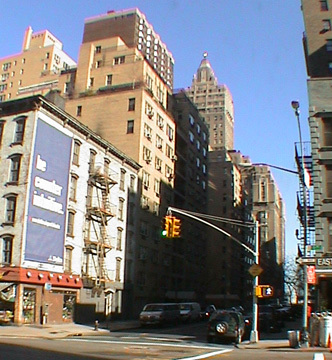 That image of startling juxtaposition was not inaccurate as the area had been a slum and river breezes could still waft the stink of the slaughterhouses a few blocks south until they were demolished to make way for the United Nations complex in the 1940's. Nevertheless, River House is swell, in the best spirit of Hollywood's preoccupation with palatial luxury in the Art Deco days of the Thirties. If you're lucky, you'll think you see Fred Astaire and Ginger Rogers waltzing in the garden overlooking the river on which the very large lobby looks. 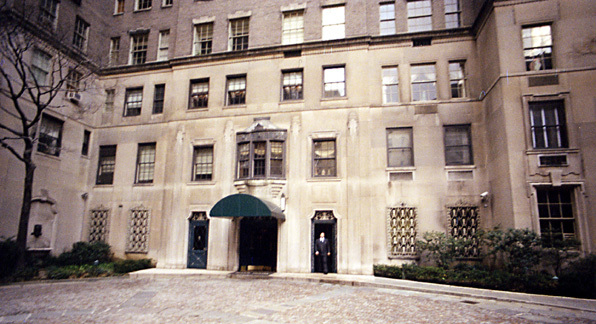 The lobby, of course, is entered through the ornately gated and large, landscaped driveway on 52nd Street. The lobby has a black floor and large cloakrooms to accommodate the many guests that are constantly attending the very swank parties being given by the illustrious residents. The apartments themselves are noble with very large rooms, very fine proportions, high ceilings and large windows for great views. It must seem almost criminal not to entertain nightly in such digs. The layouts vary considerably. There are many duplexes and a triplex maisonette. Some apartments, however, are not quite as grand as others. The River House originally had its own dock on the river, but the FDR Drive curtailed that amenity. It still has its own gardens and club, the River Club, with its own garden, pool, tennis and squash courts and dining facilities. The prestigious and exclusive club, however, is relatively sedate in comparison with some of the city's grand social clubs. As designed by Bottomley, Wagner & White, the U-shaped plan of the building consists of 14-story wings and a 26-story tower on a site 200 by 200-foot plot that runs through to 53rd Street. 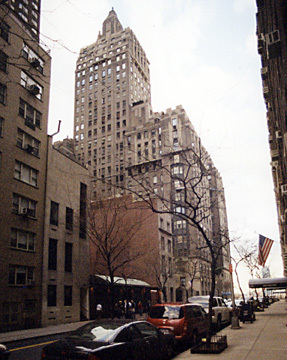 Its original plan called for only 64 apartments and the Georgian-Style-inspired design was "a critical milestone in the evolution of the skyscraper apartment house type, synthesizing for the first time the tower and the courtyard palazzo base," according to Robert A. M. Stern, Gregory Gilmartin and Thomas Mellins in their book, "New York 1930, Architecture and Urbanism Between The Two World Wars," (Rizzoli International Publications, Inc., 1987). The building is massive, but the architects modulated it well with many bay windows, limestone trim and dark gray brick and topped it with terraces and a curved finial top. Although some critics have not been totally awed by the building, perhaps because of its relative lack of decoration, it is a masterpiece of the Art Deco period in spite of itself. It simply reeks with exclusivity and glamour. 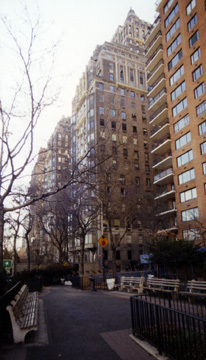 In his superb guidebook, "Essential New York, A Guide to the History and Architecture of Manhattan's Important Buildings, Parks and Bridges," (Holt Rinehart Winston, 1979), John Tauranac observes that "Clearly the architects could not make up their minds about the best style for River House, an ambivalence that is manifested in microcosm in the gates." "Ziggurated, molded, Art Deco stanchions topped by stylized eagles flank rococo iron gates, disparate styles that ordinarily clash yet seem to work fine together," Tauranac explained. The site was formerly occupied by the Cremo Cigar factory. Most of the tower apartments are duplexes. Even bereft of its yacht mooring, River House is dramatic, most grand, alluring and quite overwhelming. 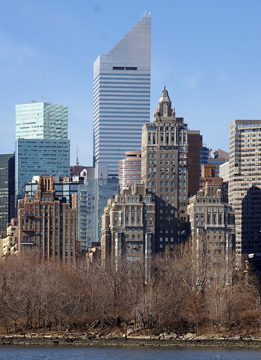 Its dead-end location is a sort of reverse snobbery to its more open, more visible towered cousins on Central Park West. For most New Yorkers, it's the end of the quest.